Home » Accessories » Hunter’s Moon – see the full spectacle in just a few hours! Hunter’s Moon – see the full spectacle in just a few hours! You may have caught the news today that Jupiter, Venus and Mars will form a triangle in the sky just before sunrise this week. A rare planetary phenomenon which will not take place again until 2021. 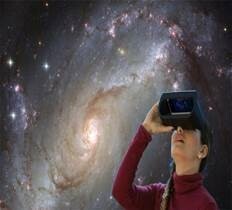 If you find yourself getting a taste for star gazing but have no idea what it is you’re seeing, Universe2go’s great new gadget, the Sky Viewer (RRP: £69) gives you all the information you need, looking at the planets and stars in real time in any weather, thanks to the use of your smartphone’s GPS technology point to the sky and it will identify where you’re looking. The brand new piece of kit is super easy to use, there’s no need to sync: all you need to do is download the free app, pop your phone into the star gazer and you’re off into the night sky. You can find your way around using just small head movements – a quick nod will zoom you to galaxies, star clusters or constellations. Plus, Universe2go provides commentary so you can learn all about life on Mars, Jupiter’s great red spot or Venus, the hottest planet in the solar system. You’ll be able to see this impressive planetary triangle all week, so do let us know if you’d like to borrow a Universe2go Sky Viewer to try it out for yourself!